Going back to the food. 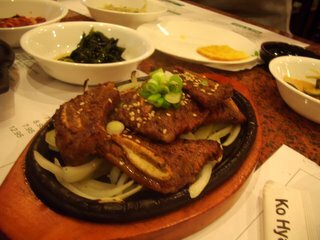 Ko Hyang is located upstairs in the mall. 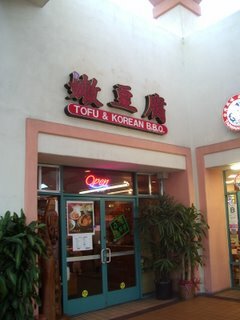 It is one of the many Korean Tofu Restaurants that seem to be taking over the world (almost) as quickly as L&L. The place was empty when we came, but then again it was 4pm and I doubt many people eat dinner that early. The waiters were kind of milling about with nothing much to do and seemed particularly eager to see us. They swooshed opened the door with big smiles and gestured for us to sit. I started to get the impression that they were desperate for business. (But not to worry, the food was above average and it started to get crowded as we left). 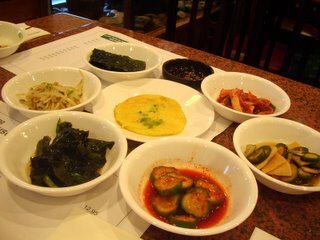 First came the complementary ban chan, small Korean appetizers. There was nothing out of the ordinary except maybe the random dish of nori. This is the first Korean place I’ve been to that offered nori as part of the ban chan. The sweet eggy pancake in the middle was a nice touch and went well with the sesame based sauce. 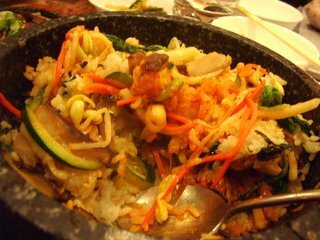 Kim chee was below par, flavorless and watery. A friend and I shared the BBQ Beef Rib and Kimchee Tofu Soup combo ($13.95). She wanted it non-spicy and I was craving extra spicy so we compromised and ordered the medium. The spicier the better, no? This was brought to our table it all it’s bubbling glory (sorry, no more bubbles by the time I snapped the picture!) 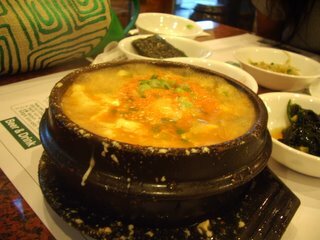 The waiter dramatically cracked a raw egg into the bowl and viola, there you have it – egg in kimchee tofu soup! This was an okay soup, though no where close to So Gong Dong, my favorite place for tofu soup back home. (Update: So Gong Dong on Kapiolani has closed (to make room for Nordstorm of all places!) and will reopen in the McCully Shopping Center later this month.) The broth was very “light” and they were skimpy with the tiny pieces beef. The tofu was also much firmer than the usual tofu that goes into these dishes. Along with the order came the BBQ Beef Rib. This was excellent, very tender rib pieces with the smoky, slightly burnt charcoal taste. You could hear the sizzle of the meat, begging you to come and tear it apart. Ohhh meat! So juicy and soft, I could have easily polished off another order. I may be lame in saying this but my favorite part of such dishes is always the pieces of grilled onions on the bottom. I like to eat raw onions (I’ll worry about my breath later) but when they’re grilled and absorb some juicy drippings from sitting under the ribs, a bowl of onions and rice is all I need for a feast! We also had…Yesss! Dolsot Bibimbap ($8.95)! 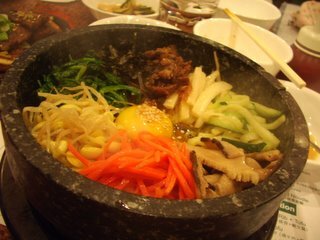 I’m a sucker for Bibimbop, especially when it’s served in the hot stone. The rice gets all crispy on the bottom and goes so well with the spicy sauce. It’s such a big, feel good, happy dish. And that’s what it looked like after I mixed everything together. Oh crap this was good. This may also have to do with the fact that I haven’t had Bibimbop in over a month. I love the play of textures you get in each bite. I tasted the clean crunch of the cucumbers with the juicy goodness of the beef in the first bite, crisp bean sprouts and sweet mushrooms in the second. All this mixed in with the spicy sauce (what’s the name of this sauce?) and rice – some parts steaming soft, others crunchy from sitting at the bottom of the stone. The complexity of flavors and the different combinations of each bite keep you intrigued for yet another spoonful. I just kept on eating, all the while thinking, please, don’t let this goodness stop! Luckily it was a big bowl. I was felt like I was going to burst into little baby bibimbops after I ate. Can you imagine what that would look like. 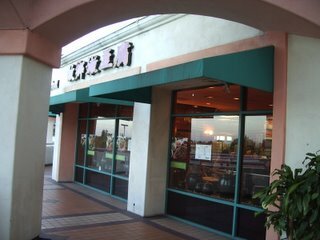 Will be back…as soon as I try all the other places in the San Gabriel Mall of culinary goodness! 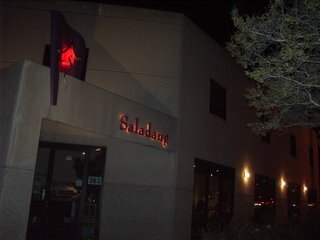 Saladang in Old Town Pasadena was recommended to me by many friends. The restaurant started off as a small operation but business grew so quickly that the owners opened up Saladang Song right next door. Song is a more upscale (aka, pricer) version of the original. Since this was our first time here, we decided to have dinner at the original Saladang. I knew I not to expect authentic Thai cooking the moment I walked. This place was much too “cool” and modern looking. 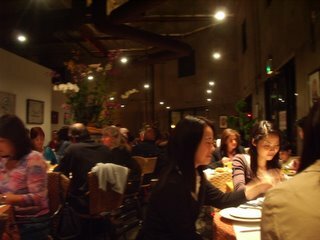 I find that my favorite Thai places are often grungy run down, hole in the wall spots, but hey, the place was packed and restaurant smelled wonderful. I suppose that Thai cooking, even when not “authentic” has potential to taste good. We started off with an order of Salad Rolls with peanut and honey mustard sauce ($4.95). Hahaha. 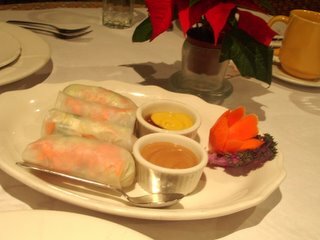 These were just Vietnamese spring rolls! The skin was much too thick and chewy but there was a generous amount of fresh veggies. A sweet and tangy honey mustard sauce was a nice change from the traditional peanut. The rolls were not rolled up tightly enough, so everything more or less fell apart by the second bite. Next was the Spicy Shrimp Fried Rice ($9.95). 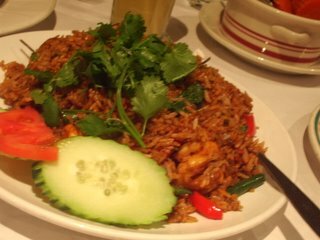 A huge plate of sizzling hot fried rice with shrimp, green beans, mint leaves and chili. This was the best dish of the night. It had a really spicy heat that kicked in right after you swallowed. Upon closer inspection of the rice I found lots and lots of tiny chopped up chili peppers as well as chili flakes. Rice dishes are so comforting and satisfying! You can always judge the authenticity of a Thai restaurant by their Pad Thai ($6.95) and I believe Saladang is proud to say that although they don’t do authentic Thai, they do good Thai that pleases the average palate (but sometimes I just want real Thai food!) 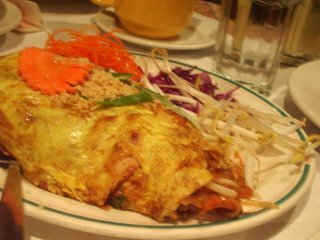 The Pad Thai was presented in an egg omelet. When the server brought it to our table we couldn’t figure out which dish it was until we saw noodles poking out from beneath. The presentation was beautiful, but tastewise, the overcooked eggs did little to enhance the dish. I enjoyed the sweet sour balance of the pad thai but the noodles were slightly soggier than expected. Pad See Iew ($6.95). This is similar to local chow funn dishes you find all over Hawaii. Stir fried noodles with chicken and broccoli in a sticky, shoyu based sauce. It’s hard to mess up and Saladang did a decent job – noodles were soft and fresh and the overall dish wasn’t too oily. 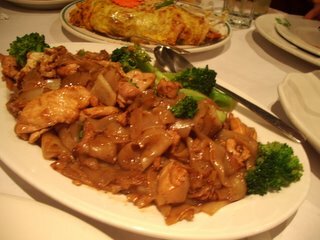 I wonder if the local choy suey places back home know that their chicken/beef chow funn is actaully Pad See Iew? :) I love how Hawaii is such a melting pot of cuisines – we’re cooking Thai and we don’t even know it! My camera just does not like to photograph Thai food (as evidence by my post at Thai Paradise), which is rather unfortunate because I have a soft spot for Thai cuisine. The yellow curry ($6.95) was delicious, although it may look like crap in the picture. 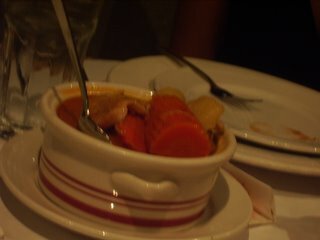 A bowl of very tender chicken, potatoes and carrots was served in a rich coconut fragrant curry. It went very well with the spicy fried rice. I usually prefer fish curries, but quickly forgot about that as the chicken here was so tender. Resting in a bath of hot thick curry, it tasted as if it had been lovingly stewed until soft and sweet with it’s own juice. The place was full by the time we left at 6:30 pm. There was a line of people outside browsing the menu as well as families coming in to order takeout. Service was friendly and efficient. The employees were Thai and spoke English with a strong accent. The waitresses were all provocatively dresses females. Provocatively dressed females with a Thai accent? That explained the large group of guys waiting for a table! Just an observation. The dessert menu boasting pumpkin custard and Khao Neow Dum Piag (black rice pudding) was tempting, but I need to demonstrate some self control, right? 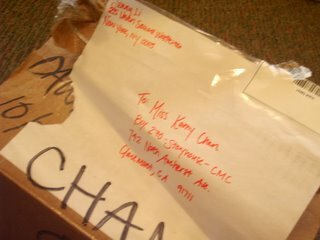 Much thanks to Jenny who sent me the most exciting package I’ve ever received in my life! :) Pooh on the US Post Office who can never seem to do anything right. The package was sent out via 7 day shipping, but it never arrived until 3 weeks later as the post office had mistakenly sent it to another office. But I’m just glad it is here and (most) of the food is edible. The highlight of the package was a book that I’ve had a sinful craving for (yes, you can crave a cookbook): Mario Batali’s Molto Italiano! Not only did Jenny send the book, she sent a hardcover edition. 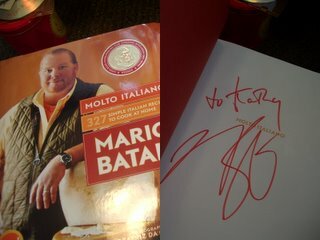 And not only was it hardcover, it was autographed by Mario Batali himself! Oh man! Oh man. This just about made me the happiest person in the world. And to think I lived right next to Babbo’s last year and never ate there (but I did have the olive oil gelato at Otto’s which is insanely good). I hugged the book for 10 minutes and then spent the next 4 hours reading though it. Sigh. I love reading cookbooks. I went to sleep with wonderful dreams of Osso Buco with Toasted Pine Nut Gremolata and Fried Lamb Sweetbreads. Ahhhh, can’t wait to cook all winter break! 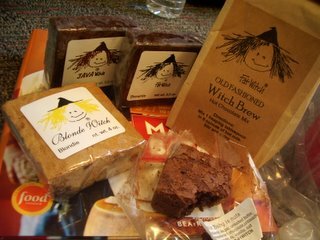 The book would have been more than extravagant gift itself, but Jenny went all out and sent my favorite brownies from all of the city, Fat Witch Brownies. Clockwise from bottom left is the Blonde Witch (choco chip cookie brownie), Java Witch (coffee brownie), Fat Witch (the original) and the Baby Walnut Witch (original w/walnuts). And on the right is a pack of their “Witch Brew”, a hot chocolate mix that produces a very creamy dark and decadent drink. As you can see I attacked the Baby Walnut first. I love these brownies because they are dense and fudgy. Some complain that they are too sweet, which is hard to argue but this is a good kine sweet! It’s a intense chocolatey sweet, similar to a flourless chocolate cake – you know it will cause cavities but its so good and just begs to be eaten. And so what can you do but eat it? hehe. After I took this picture, the Java Witch was consumed. I need to learn how to share desserts or I’ll die of a heart attack pretty soon. Next door to Fat Witch in the Chelsea Market is Eleni’s, a sweet shop specializing in all sorts of fanciful cookies. 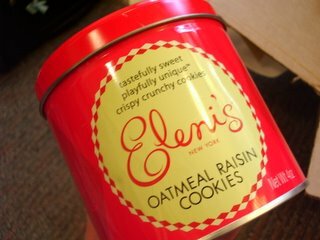 Included in the package was a tin of Eleni’s oatmeal raisin cookies. These cookies rock. They’re wonderful light and crispy, with just the right balance of raisins and the nutty flavor of oats. The shop also makes pretty good cupcakes ( they’re 1/2 off an hour before the shop closes). My favorite cupcake is the “George”, a brownie like cupcake with marshmallows and cookie crumbs mixed into the batter. 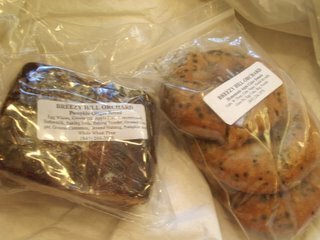 If the Post Office had done their job correctly, I would also been feasting on Apple Cider Doughnuts and Pumpkin Ginger Bread from Breezy Hill Orchard at the Greenmarket. But they didn’t. And so I don’t want to think about it because food gone bad makes me mad. The doughnuts and bread were all moldy but smelled so good. I actually tried to take a bite (talk about desperate). Bad idea. Don’t eat moldy baked goods! 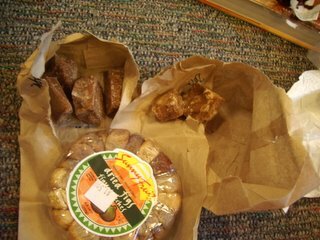 Also from the Greenmarket were cubes of Maple Sugar, both plain and with pecans. These were great on their own, they seem to disappear in your mouth, leaving behind a faintly sweet taste of maple with a nutty undertone. They also made a delightful addition to my cup of tea in the morning. On the bottom is a package of dried figs from the grocery store in the Chelsea Market. I think I’ll incorporate them into my next rice dish, inspired by Robyn (that was some pretty awesome curry and rice dish you made! ), with some spices and hazelnuts. And that. That was all good. All so good. No, good doesn’t do it justice – I’m exhausted and happy in the best sense of the word. I felt like I just took a walk to all my haunts in the city and indulged in all my favorite sweet treats. Thank you Jenny! (We do a lot of co-cooking over the phone with Batali’s book over break)! After a spending all Friday night studying for an upcoming Accounting, a friend and I decided we needed food! Unfortunately, every restaurant in Claremont seems to close by 8 pm, leaving us with only fast food options which just wouldn’t suffice. So we drove down to Rowland Heights and after a bit of searching found one restaurant that was still open at 3 am. Definitely not the ideal spot for great food, but with no other restaurants open (not many people crave jook at such odd hours) and having driven so far, we decided to eat here. I didn’t realize how much (bad) food we ordered until it all came – that’s the consequence of being tired and really hungry at the same time! 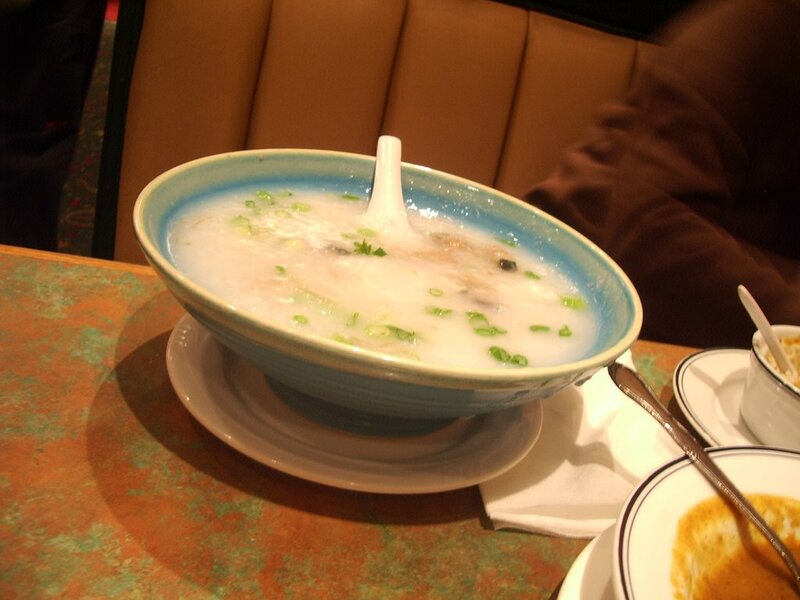 First came a very bland Pork with Preserved Egg Jook ($4.25). 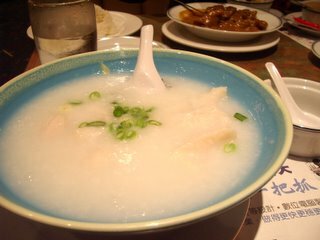 There was absolutely NO flavor to this dish, just a bowl of plain jook with tiny pieces of egg and a couple shreds of pork. The Fish with Preserved Egg Jook ($5.25) was equally dissapointing. We ordered the E-Fu Noodles with Crab Meat Soup ($5.25) out of sheer curiosity. This too, was a mistake. 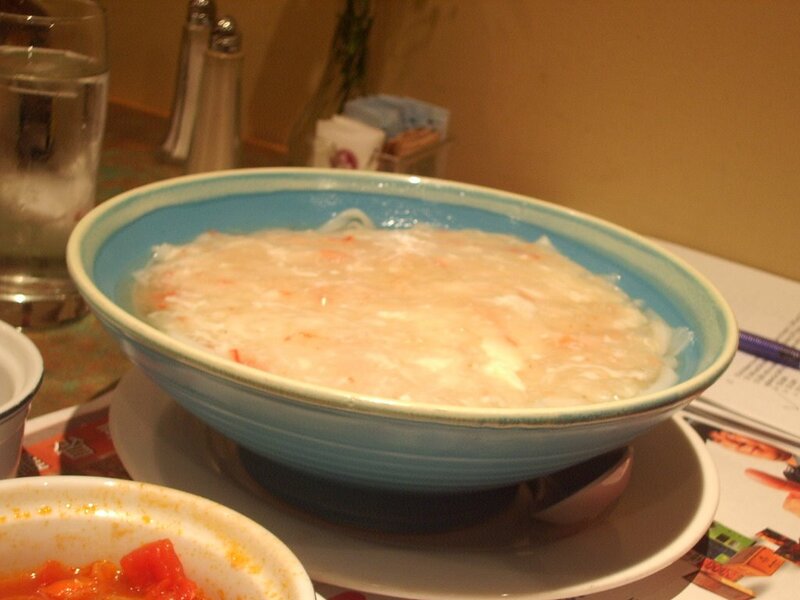 The bland soup was thick and gelatinous with shreds of imitation crabmeat. It was a very confusing dish – the noodles and the soup were gummy and mucus-like in texture, I don’t know what to make of it! Eww. Look at this. 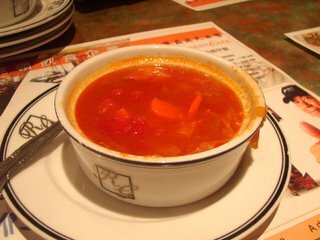 Beef Stew Curry ($6.75). 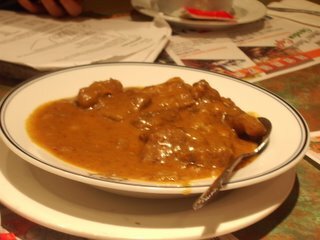 Chunks of hard, chewy beef swam in a gooey brown mass that didn’t even resemble curry in flavor. It was awful. At the end of the meal our waiter brought out a bowl of Hot Bortsch. (Don’t ask why a Chinese restaurant feels obligated to serve Bortsch). I think he felt bad for seving us such poor quality food. Either that, or it was leftovers from the kitchen. The soup was semi-decent, tasting like something from a can of Campbells. This was sadly the best part of our midnight snack. Driving back to school we passed a 24 hr Korean restaurant. Poo. Next time we know where to go – or at least where not to go. 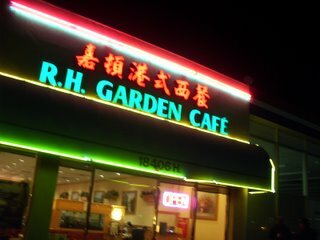 Or maybe we should go earlier as there are many excellent places in Rowland Heights, as well as an abundance of Chinese bakeries! Any recs (been meaning to try Capital Restaurant) for Rowland Heights area, Kirk? Yay for Indian food! Diamond Palace catered an Indian lecture at school today, which means free lunch! I had grown so accustomed to eating a lot of Indian food in NYC that I found myself missing Indian cuisine more than local Chinese food. 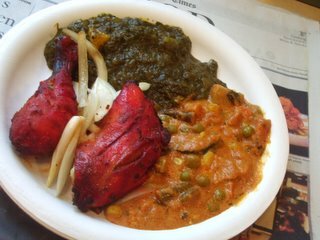 Unlike NYC, good Indian places are far and few in SoCal (we make up for it with lots of excellent Asian food). Hawaii has recently begun to expand it’s section of Indian restaurants along King Street and the Kapahulu area. I’ve yet to try most of them, but will report back as soon as I do during winter break- just another plug for home :) look at all the culinary progress we’re making! I forgot to take a picture of the other items I had, but in addition to the Palak Paneer, Tandoori Chicken and Navratan Korma, I ate some very spicy Samoas, a few pieces of Naan, basmati rice and Gulab Jaman. A very good lunch indeed! The cubes of cheese in the Palak Paneer were just the right texture – not too soft or undercookied, nice and creamy, mmm…cheese and spinach. 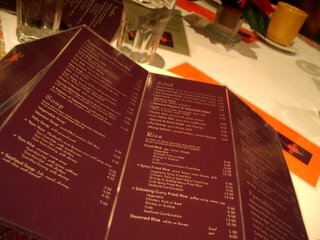 The samosa’s were addictive (hell, all Indian food is delicious!) – big crispy triangles filled with a spicy mixture of curried potatoes and peas. My favorite Indian sweets are Kheer (a very rich rice pudding) and Kalakand (a cheesecake like sweet, only much lighter and based on ricotta cheese) but Gulab Jamans come pretty close. They are ping pong ball sized treats of deep fried milk balls. The balls are soaked in a sticky honey syrup and served cold. Man, do Indian people know how to cook – we need more Indian restaurants in Claremont.